When you're in pain, you shouldn't have to travel far from home to get relief. 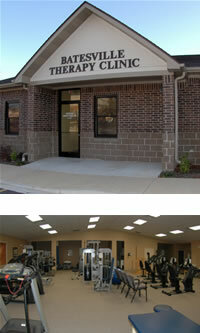 Batesville Therapy is your "hometown" provider for all of your rehabilitation needs. We are a privately owned Outpatient Rehabilitation Clinic providing services in Physical and Occupational Therapy, Sports Medicine/ Athletic Training, Industrial Rehabilitation. In addition, BTC is a multidisciplinary facility for neurological impairments, vestibular issues, and treatment of the hand and upper extremities. Feel free to visit our Batesville location at 1310 Sidney St. between the hours of 8:00 a.m. and 5:00 p.m. If you have questions about our clinic or would like to contact us by phone, please call (870) 612-7200.